Keep up to date with grassroots organizing in the West! 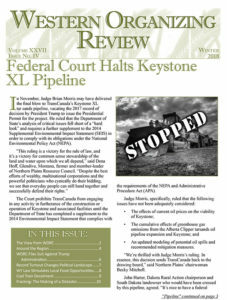 The Western Organizing Review is WORC’s newsletter. Offered four times a year, the Review provides the context and background to understand some of the most contentious issues that impact western communities. Follow our work on agriculture, oil and gas, coal, grassroots democracy, clean renewable energy, and more. We include a round-up of the great work of our members take throughout or region, and a message from the WORC Board Chair in each issue. The Review is your source for information on the state of grassroots organizing in the West. Get the Western Organizing Review four times a year! To receive the electronic version in your in-box, subscribe here, or get the paper version delivered to your mailbox by contacting billings@worc.org.